Nice, right? Of course, we'll have to see how it does in low light, but I still bet it'll be a thousand times better than my old LG. Sorry for all those years of crappy cell phone photos! 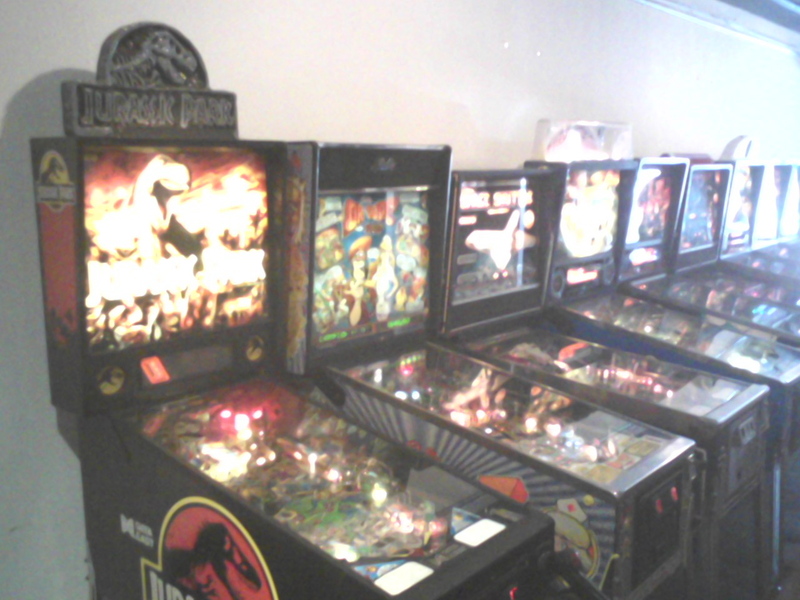 If there is a pinball god in PinHeaven, there NEEDS to be a machine made after this movie! 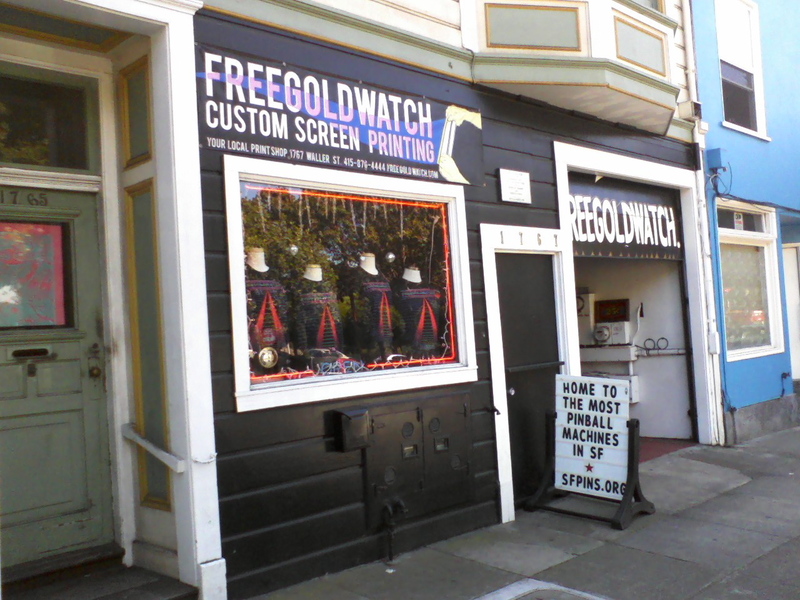 Free Gold Watch - the best pinhall in SF! A few weeks ago my wife Claire had to pick up some new fabric from a shop in the famous Haight Ashbury neighborhood in San Francisco. I needed an excuse to get out of the house (we both work at home), so I decided to come along with her. Just as we were heading out the door, Claire (BLESS HER HEART) said, "We should check the pinball map!" 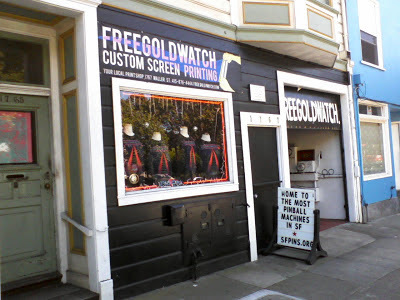 We pulled up the neighborhood on pinballmap.com and saw that there was a location called "FREE GOLD WATCH" that supposedly had a ton of machines. We tracked down their website, which had absolutely nothing about pinball on it. "Well," I said, "we'll give it a shot!" We found the place without too much difficulty, and their sign revealed that it is a screen-printing shop that makes T-Shirts and posters and stuff. 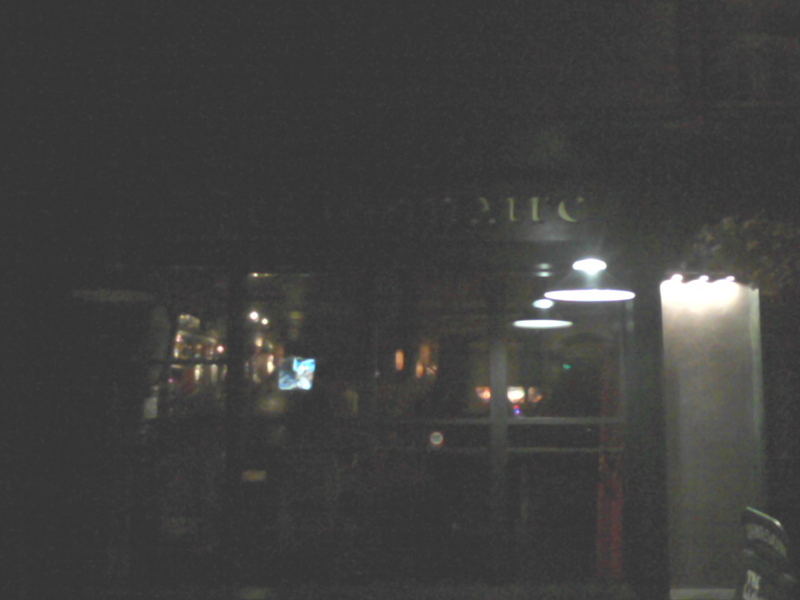 Here you can see what it looks like from the outside, which is to say, not much. BUT! 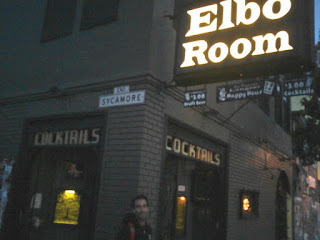 Please note the little sign which reads "HOME TO THE MOST PINBALL MACHINES IN SF!" As I crossed the street, I wasn't really sure how this little storefront was going to deliver on that promise, but luckily I was pleasantly surprised! 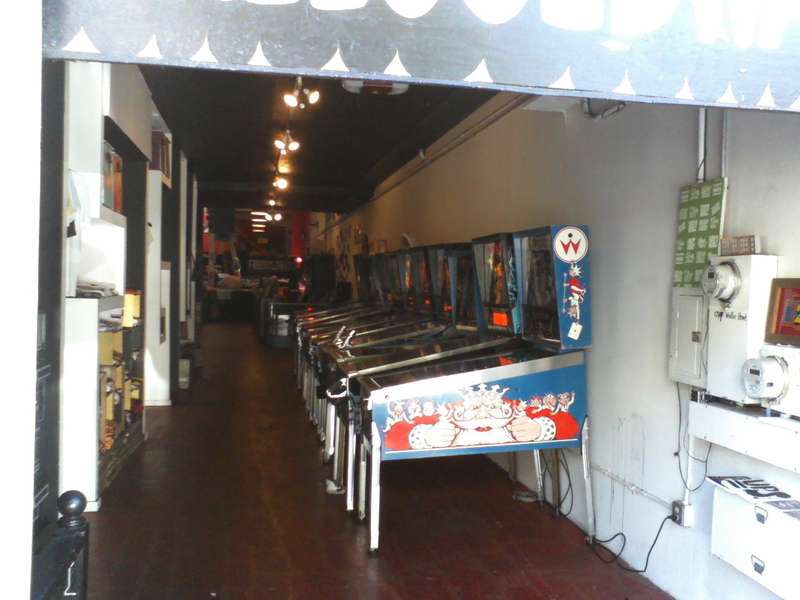 It turns out that the screen-printing shop is waaaay in the back, and the owners took a long hallway that leads from the street to the shop and turned it into an awesome lineup of pinball machines. When we were there, they had all kinds of great machines like: Demolition Man, Dirty Harry, Dr. Dude, Jokerz, Jurassic Park, Lethal Weapon 3, Pinbot, Space Shuttle, Terminator 2, Whirlwind, White Water and World Cup Soccer, plus a bunch of others. Talk about a great lineup! There were some games I knew really well, and a few that I had only played once or twice. On the whole the machines were working great, with a few minor exceptions. We didn't have a ton of time to play, so I pretty much just went down the line and played one of each game. I think the craziest game I played was Dirty Harry (Williams 1995). 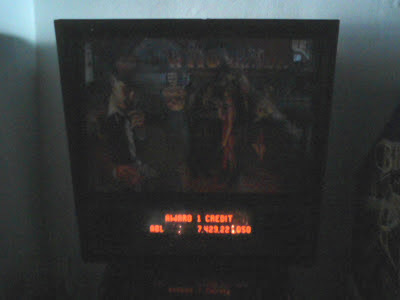 I was shocked to find that it was a very complex game, with a dot matrix display, lots of ramps and a deep ruleset. It's hard to imagine now, but I love the thought that in 1995 Williams was willing to make a new pinball machine based on a movie series from twenty years prior. If only that were still the case! The only tragedy is that this place is a real hike from my house. It takes about an hour of walking, BART and bus rides to get there. Oh well, if I'm ever in that neighborhood again, you'll know where to find me! LAST HOURS OF KICKSTARTER! BACK THIS PROJECT! What more is there to say!? PAPA has done an amazing job promoting and supporting pinball! This Kickstarter project that they've started is almost over, and they have far exceeded their goal. That is NO EXCUSE not to back this project! Every penny is going to help PAPA put together more amazing livestreaming programming! If you are a stern investor and need more convincing to part with your honestly earned lucre, consider this dashing shirt that you can get at the $50 level, designed my yours' truely! My last two high scores both happened on the same day during a recent trip to Portland, Oregon. 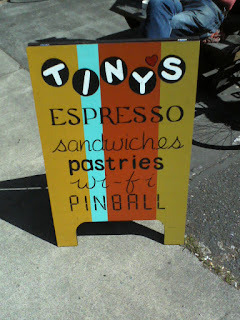 I played A LOT of pinball on this trip to Portland and my poor wife Claire was being dragged along for all of this! Actually, Claire really enjoys playing pinball, but not for as LONG as I do. After an hour or two, she's pretty much done, whereas I can play all day. Saturday and Sunday we were tabling at the Stumptown Comics Fest and then Sunday night after the show wrapped we went to dinner downtown. 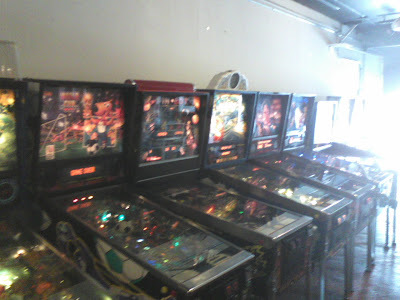 We made a plan for Monday that involved some fun non-pinball related activities, including a trip to the famous Goodwill "bins" for Claire, so I knew I was wrapping up my PDX pinball marathon. We made one last trip to Ground Kontrol, and I promised to only stay for about 20 minutes, so I had to choose wisely... When you see the lineup of machines that GK has on hand, you probably won't agree with my choice, but Jon at least will understand. 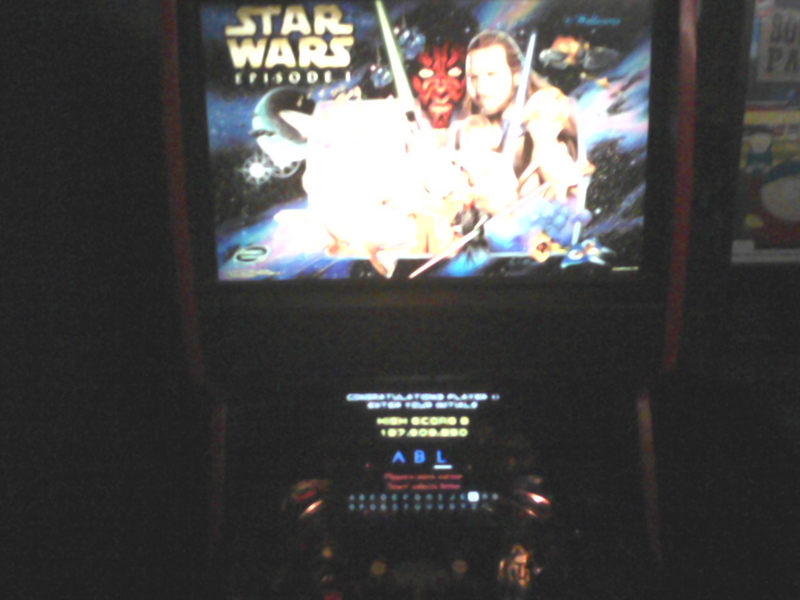 I plunked my quarters in Star Wars: Episode I, the Pinball 2000 machine that he and I cut our pinball teeth on. I was having a great game, maybe the best game of SW:E1 that I've ever played, but about halfway through the South Park machine next to mine broke down and two techs came in to see what was wrong with it. I TRIED to concentrate on my game twice as hard, but they were yelling back and forth, and taking the glass off, and playing a FULL game without the glass (super loud! ), arguing about whether or not to turn the machine off, putting the glass back on (bumping my arm!) etc. etc. My concentration lapsed and my best ball came to an end. I got right up to the J-E-D-I of the third round and only had to sink one center shot to start the Jedi Master round of Darth Maul (which I've only seen once, and can't even remember what it is!) but it was not meant to be. My ball drained before I could cash it in. I still ended up with 137 million, which was good enough for the #3 High Score. 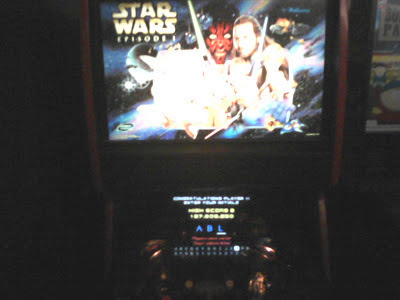 It was very frustrating to be ONE SHOT away from getting into that third Darth Maul round, which would have added five million points, and opened up the fourth and final "Jedi Spirit" round (WHICH I HAVE NEVER PLAYED), but I guess that's the sign of a great pinball machine, right? It leaves you feeling like you gotta play ONE more game, that surely this time you'll make it to the end! I hope these High Score posts have been fun. I'll post more as I score them! Only HOURS after my high score on WHO Dunnit, I got to enter my initials into another pinball machine in Portland, Oregon. We had just eaten dinner, and we decided to play "connect the dots" using the pinball map app, trying to hit as many pinball machines as possible en route from the restaurant back to Greg's apartment. After a few stops, we ended up at a bar called Red Flag which had a Creature From the Black Lagoon, the original Simpson's Pinball (Greg's favorite), Medieval Madness and an Attack From Mars. I warmed up with a game of Medieval Madness. I own this game, and mine is pretty much in perfect condition, so it's always a little painful to play a Medieval Madness on location, but in some ways it is a good way to get me honed in because I can't rely on my "home" timing and shot making. After my warm up game (and really, I had been playing pinball ALL DAY, so I was pretty warmed up!) I moved over to the Attack From Mars. I've seen this game played dozens of times by the world's best players in the PAPA videos, and the layout is very similar to Medieval Madness, so I had a pretty good idea of what I needed to do on this machine. Once again the pinball-reality wormhole opened and I played for what felt like forever. I remember clearing all of the cities which was pretty cool and having some pretty successful multiballs, where I actually trapped and controlled the balls, which is new for me. When all was said and done, I ended up with 14 billion which was the #2 score. I had been playing for a LONG time, and when the last ball finally drained I realized that there was a guy with a beer who had been watching me for a while. "DUDE!" he said, "that was an AMAZING game of pinball!" I thanked him for the compliment as I wiped my sweaty brow and then plugged in my initials. Two high scores in one day! Two-fifths of a "cycle." Definitely my best day of pinball ever... so far! On my recent trip to Portland, Oregon I got three high scores. 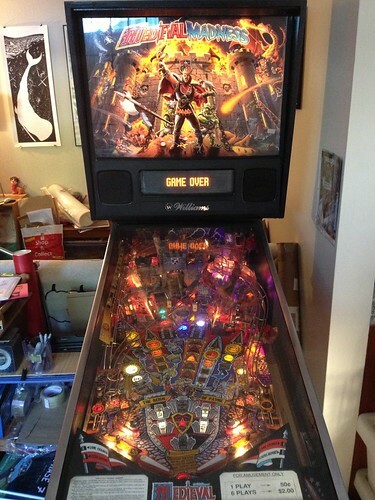 The first one was arguably some of the most fun I've ever had playing pinball. I was hanging out with my buddy Greg and we were killing time while our friend Liz was getting a tattoo in NE Portland. 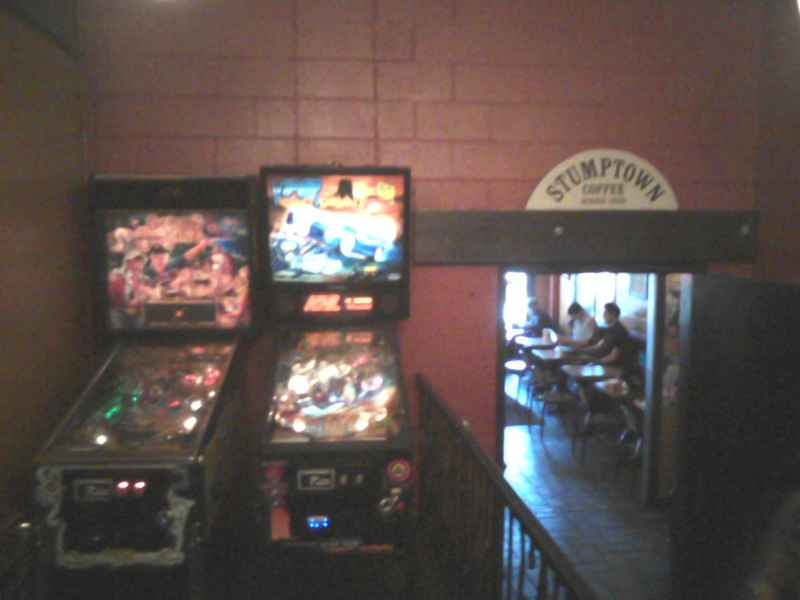 Across the street from the tattoo parlor was a restaurant called Skyline Burgers, and because it's PORTLAND, they have three pinball machines in the back: Batman (Stern, 2008), Pirates of the Caribbean and WHO Dunnit. Greg and I had played maybe three games of WHO Dunnit between the two of us in our entire lives, so we were coming to the game with fresh eyes. 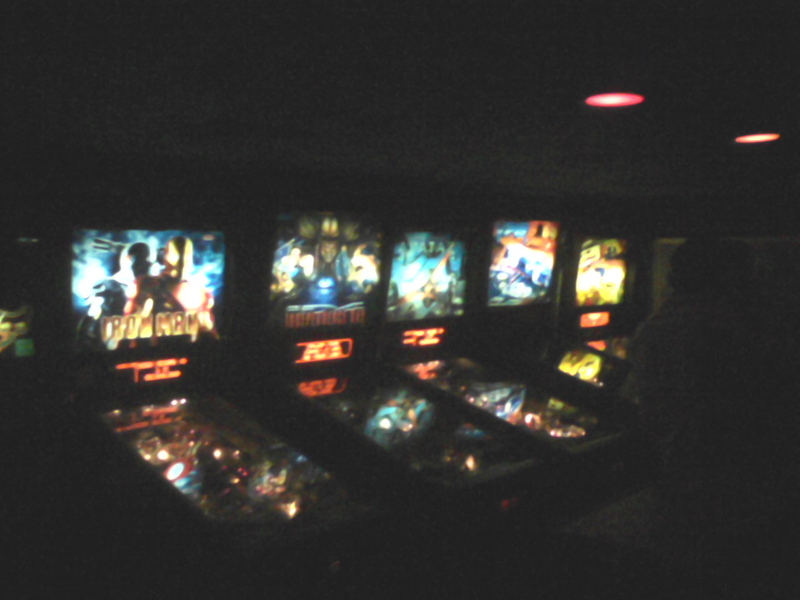 To me, this is when pinball is at its most fun. We played a number of games and were pointing things out to eachother as we learned them. "Hit this shot when the phone is ringing" or "The jackpot is over here" etc. etc. This game had a really neat feature which I had never seen before. When you put in your money you could either select "beginner" which gave you two minutes of play with an unlimited ball saver or "advanced" which had regular three ball play. Greg and I played a two player game of "beginner" which really helped us get to know the machine, and then we fired up a two player game of "advanced". Again, I entered some sort of wormhole in reality, and I was hitting everything I needed to, and saving anything that looked like it was going out. I locked in on the shots and eventually made it all the way through the wizard mode. When I got to the victory lap, I really cleaned up, ending with 7.4 billion points, which was the #1 score. This was especially rewarding because ALL of the other high scores were by one person - NMM (I think?) So I was imagining this person coming in to play the next day and going "What?! Who is ABL???" This is why high scores are fun - you have to defend your turf! A couple of weeks after my high score at the Legionnaire, it was my pal Dave's 30th birthday so a bunch of us decided to meet up at the Elbo Room in San Francisco. 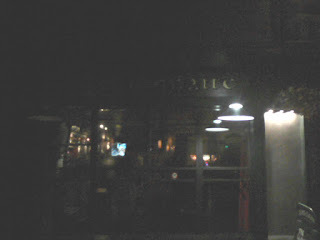 It's hard to see in this photo, but there is a tiny sign on the left, under the "cocktails" sign that says "PINBALL!" This was my kind of place. They had an interesting lineup, with some old Sega machines (Independence Day and Viper???) that I had never seen before, but sadly, a lot of these machines were beat up and not working well, including a Simpson's Pinball Party that was completely out of commission. I spent most of my time playing Avatar and Iron Man, which were both working fairly well. 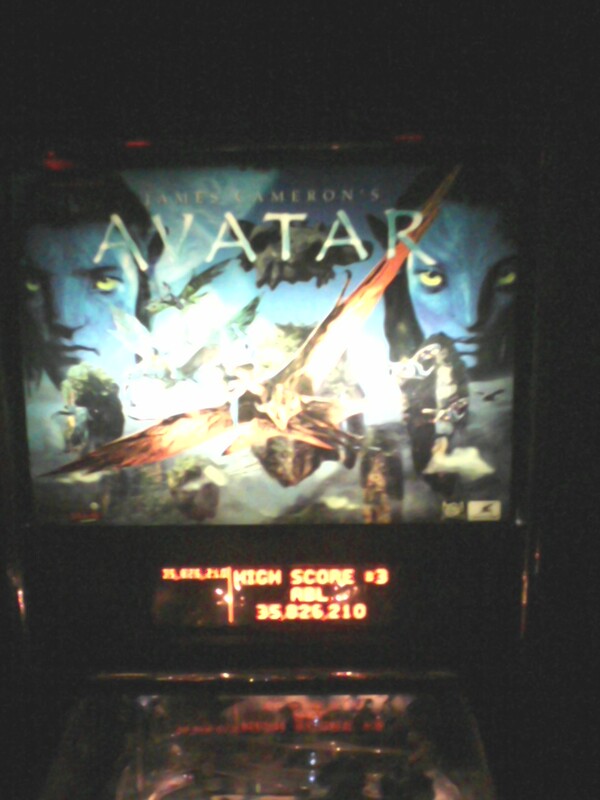 When Avatar first came out a few years back it was in a lot of PAPA videos, so I have logged a lot of time watching really good players attacking this machine. I had a pretty good idea of what I needed to do to set up a solid multiball or two, and pretty early on in the night I grabbed the #3 high score with 35 million. Not the highest score in the world, but Stern games are usually pretty low scoring, and anyway, I still felt cool plugging in my initials while other folks were flipping away on their machines. In my next post I'll cover one of THREE high scores that I got on a recent trip to Portland, Oregon! 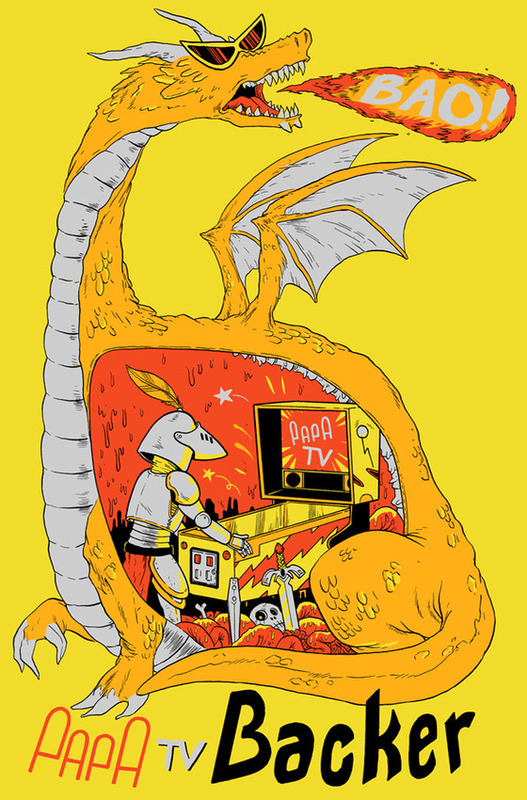 When Jon and I started playing pinball, we knew nothing. Our skills have slowly improved and up until now, the most I've been able to brag about was getting a replay on various pinball machines. A replay feels pretty good - there is a certain endorphin rush that comes from causing that *KNOCK* out in public. It lets people know that you have some idea what you are doing with a pinball machine. At some point in the last few months, I leveled up, and now I'm actually getting High Scores, which feels about ten times as great as getting a replay. Sure, I have "marked" machines in the past, but mostly in White River Junction, VT where Jon and I were generally the best players in town. It feels like more of an accomplishment marking a machine in a larger city. Over my next five posts I'm going to outline some of my recent high scores. On the first Friday of every month, my wife Claire and I walk down a street fair on Telegraph Avenue that happens here in Oakland. 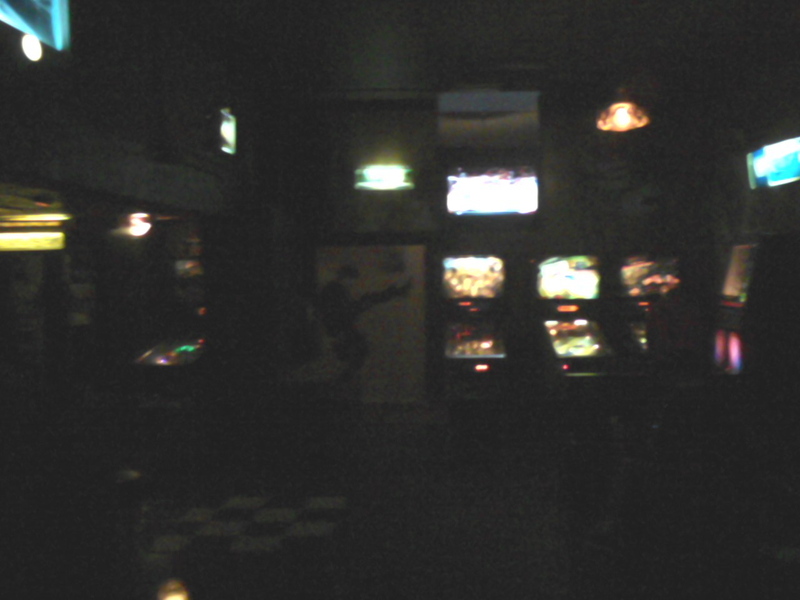 A few months back we saw a new bar pop up, which initially didn't even have a name on it, but it had one pinball machine in the back, can you spot the glow through the window? I did! 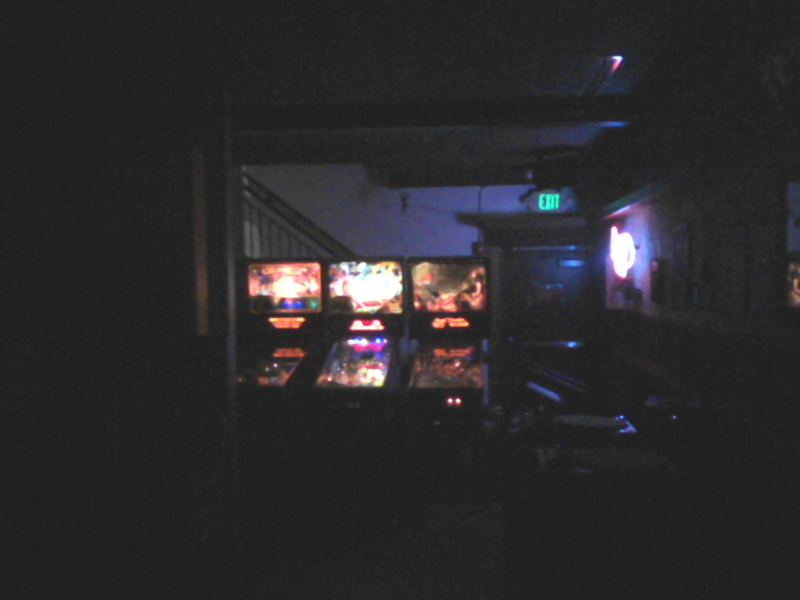 When we came back the following month the bar had been named The Legionnaire Saloon and it now had three machines: Championship Pub, X-Men and Scared Stiff. 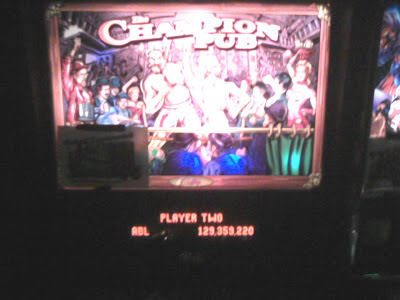 We ordered a beer and put a few credits in on Championship Pub, which was working the best of the three machines. As Claire and I played, I slowly started figuring out the ruleset and where the lock shots were, where the jackpots were, etc. And then, on like my second or third game, a weird wormhole in reality opened up and I just couldn't drain. I was saving everything, and hitting what I needed to hit. I went through fighter after fighter and was figuring out objectives on the fly, like the strobing targets. I ended up making it through the Wizard mode, and getting the #2 score on the machine with 129 million. NES (who, as far as I can tell, is currently Oakland's best pinball player) had a Grand Champ of a billion, so I still have a lot to learn, but this still felt pretty great! 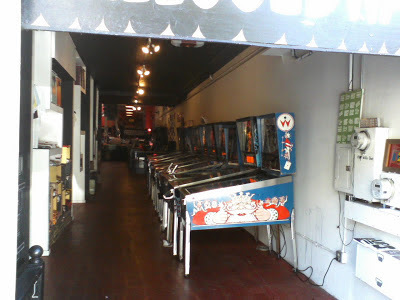 In my next post I'll cross the bay to play a little pinball in San Francisco! Man, I had fun in Portland last weekend! Now, I have mentioned before on this blog that Portland, Oregon is a pinball paradise and I'm here to tell you that this is more true than it has ever been. 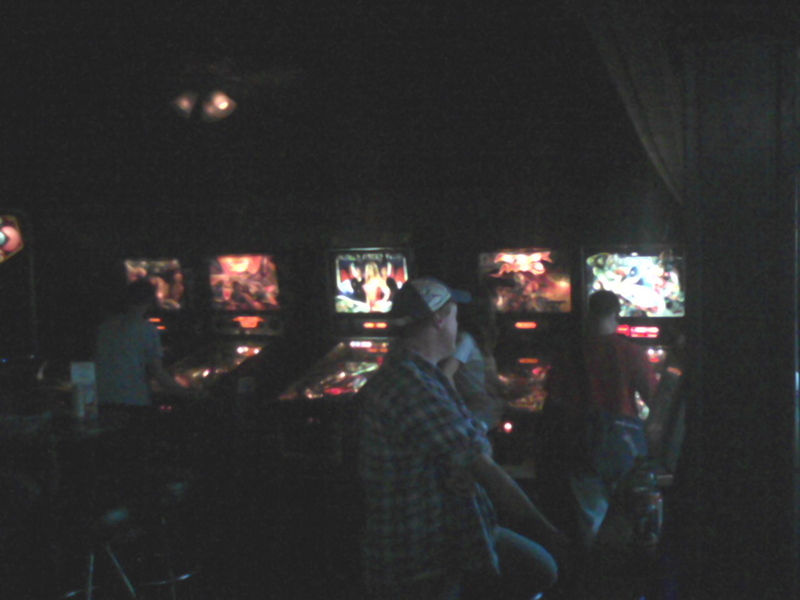 Sure, Portland has some real A+ arcades like Ground Kontrol, and bars packed to the gills with pinball machines, like C-Bar, but I think the thing that makes Portland special is that every little nook and cranny of this city is filled with pinball. We stayed with my buddy Greg while we were in town, and were hanging out a lot with our pal Liz. Both of these friends have dutifully added the Pinball Map app to their smart phones, and a number of times on this trip we found ourselves at "Point A" (at breakfast for example) and then we had to get to "Point B" (back to Greg's apartment). 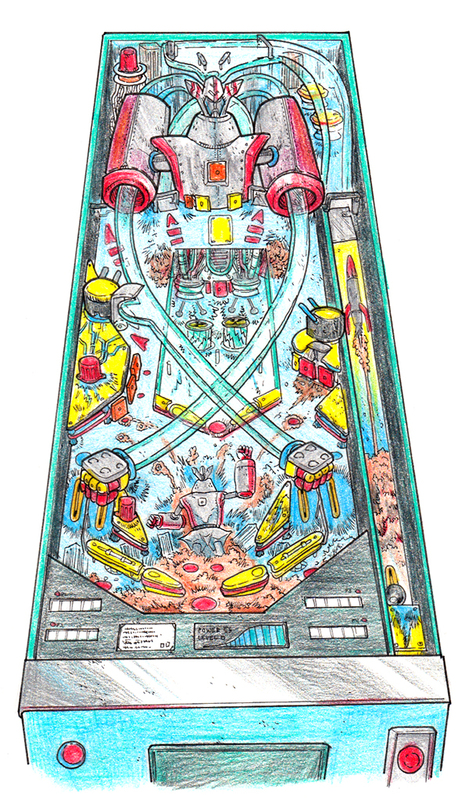 We'd pull up the Portland Pinball Map and look at what was open between here and there, and we'd hit as many machines as possible. There are A LOT. THIS IS WHAT I'M TALKING ABOUT, PEOPLE! How often when you are walking around in the world do you see a weird spot like this - a dead end at the top of a ramp platform with some empty space - and do you think "Man, you could fit like two pinball machines in there!"??? I think about this stuff ALL THE TIME, and as far as I can tell, Portland is the only city that hears these thoughts and/or WISHES and makes them come true! 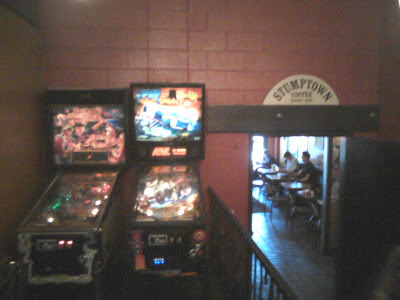 Bars, coffee shops, laundry mats, restaurants - there are pinball machines everywhere! This is how it should be. I also tracked down the new Avengers machine to give it a try. 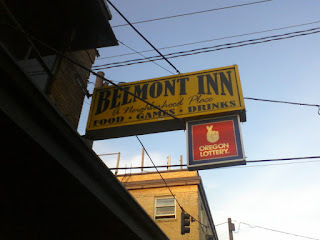 We found one at the Belmont Inn, with $1 per credit (ouch!) or $2 for three. This feels especially steep when the machine is in a line with a bunch of other great machines which are priced at 50 cents per credit. 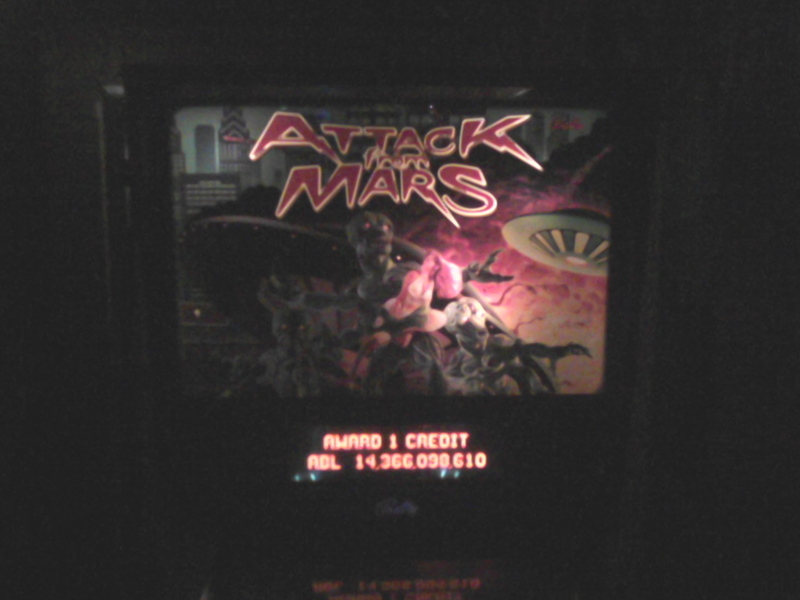 Do I have TWICE as much fun playing Avengers as Attack From Mars? Definitely not. I understand that there has been A LOT of inflation since Attack From Mars was released, and that it's a new machine, but the $1 price point definitely limited the number of games I played on that machine. Anyway, it was fun! The design feels very open while still having a few ramps. That black widow ramp shot is pretty darn hard to hit! Hulk multiball was really fun and I love having drop targets on a machine again! Overall a challenging board that I'd like to spend more time with, if I could ever afford it. I have a lot more pinball photos from my trip, but I think I'll spread them out into a few posts. Now that the dust has settled from the DTZ #5 release, we should have some more time for blogging! In conclusion: if you ever have an excuse to visit Portland, DO SO. And don't forget to pack some quarters!